As exciting as it may sound, feeding babies can be quite a hassle for parents. You may be able to avoid it for the first six months or so but time will come when you will eventually have to feed them with the same food that you serve on the table…sort of. Unlike adults, babies need a little more help when it comes to their food which is why parents love using cool tools such as baby food maker to help make the task a bit easier. Obviously, babies cannot chew the same-size food as adults so you will have to process it and turn it into tiny chunks or make it even smaller, with the consistency of a sauce or paste. The choices can be overwhelming for parents: there are blenders, processors, all-in-one steamers and even hand-crank food mills. But, which one truly suits your baby and your lifestyle? Do you really need a food processor for baby food that has an electric motor inside? Would you rather want to use a machine that prevents burns or can let you cook awesome recipes? Will it allow you to just prepare one serving at a time or can you produce several at once? We have made a list of the best food processor reviews to make shopping a lot easier for you. Be sure to choose one that fits your budget and your needs well and you should not run into any problems when making food for your little ones. The Beaba Babycook may be the most expensive item in our list but we can guarantee that it won’t disappoint you. We all want what’s the best for our kiddos, right? And, when it comes to the best baby food maker, we are quite sure that this product is well worth every dollar you invest it in. Not convinced? Well, read on. 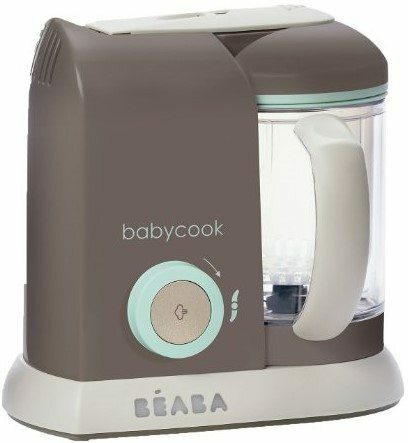 So, what is up with the Beaba food maker and why does it come with such a premium price? Easy. This mean baby machine can actually do four things so you can ditch all other machines and replace it with this. Need to defrost ingredients or reheat precooked meals? This one comes with a steamer that you can easily leave behind (it shuts off automatically and beeps when it is done). If you are preparing meat for your little one, you can also use the Babycook to cook the meat until it is tender enough for them to chew on and swallow. If you would like to prepare purees and smoothies, you can also use this machine to blend in all the ingredients together to make one healthy and wholesome meal for your little one. Sounds great, right? It might not look like much but this baby food processor also has among the biggest capacities. At 4.7 cups, you can make up to 18 servings of baby food in one go. That will definitely save parents a lot of time so they can spend it on more important things such as playing with their kiddos. And, despite all the functionalities that it comes with, this machine comes with a one-hand operation so even if you have your baby in your other arm, you can still prepare meals without a problem. Obviously, we love the Beaba Babycook and we highly believe that it deserves to be placed at the top spot in our list. It is truly worth every single penny you spend on it. When it comes to making nutritious homemade baby food, among a parent’s biggest dilemma is finding the best baby food processor that can help them create these in huge batches. Enter the Baby Magic Bullet which allows one to make a week’s worth of baby meals in just five minutes. Cool, huh? What we like most about this awesome 20-piece package is that it is very versatile and flexible in terms of the types of food that it is able to make. For starters, you can easily make a puree out of this one and store all food inside the date-dial storage cups, allowing you to keep track of when you made the food so you only serve fresh meals to your baby every single time. You can also put the food in the batch tray then place it inside the freezer and, when your baby becomes a toddler, you can continue giving them healthier meals and snacks in the form of homemade popsicles! Smoothies are a great option as well. So, how does the Baby Bullet differ from the Magic Bullet that parents already use? Why is it considered as the best blender for baby food? Aside from the add-on accessories such as the date-dial storage cups, freezer tray and smoothie cup, the blender itself also comes with an additional milling attachment so you can further grind rice, oatmeal or other similar ingredients so they are easier for your baby to chew and swallow. Overall, this can be considered as one of the best baby food grinders available in the market. It comes at a great price considering its functionality. However, if you are looking for something more, say a steamer function, you will be disappointed as this one does not have that and you will have to purchase the steamer separately. Still, with all its features and accessories, we think that the Baby Bullet should be placed at the second spot in our list. Yet another food processor for baby food that comes at the expensive price range is the Cuisinart Baby Food Maker and Bottle Warmer. Yes, you read that right. Not only is this baby machine great for preparing food (steaming and blending), you can even use it to warm bottles which means one less machine for you to get! Now, what are the awesome things that come with this product? For starters, it works really great as a food mill. It can accommodate up to four cups of baby food ingredients and steam, chop or puree them without any problem. While preparing for your family’s meal, you can cut up a bit more of those vegetables and meat and even add in some rice or oatmeal. No need for getting out an extra pot or pan because you can dump all the ingredients inside the bowl and the machine will do the rest for you. Simply turn the dial to get the steaming function or if you want to further slice the ingredients first, you can also chop them up using this machine. Another thing we like about this product is that it creates really thin purees which are perfect for making homemade baby food pouches. Or you can always turn them into popsicles, too, and ensure you get your little ones healthy yet fun snacks every single time. Despite its huge size, this Cuisinart baby food maker comes with very few parts (bowl, blade and lid) so cleaning them up is a very fast and simple process. Plus, they are top-rack dishwasher safe which makes it even more convenient for everyone. However, it is also important to take note that its water container needs proper maintenance to prevent build up of minerals and growth of bacteria. Otherwise, we have seen no problems with this machine, even the discoloration that some parents have complained about. We also like that it comes with a bottle warmer function but it is still slightly unreliable so we are pushing this one to the middle of our list. Parents who are obsessed with making the best baby food using fresh ingredients from home will definitely love that Nuk has made it easier and cheaper for you to prepare them every day. This 20-piece set should be more than enough to get your baby started in eating fresh and nutritious meals every single day. All you have to do is fill the cup with fresh ingredients then make a puree out of it for a healthy, homemade meal for your babies! Once they start growing up, the Nuk Smoothie and Baby Food Maker also grows with your kiddo. By this time, you can start blending ingredients and make smoothies. You can make them in huge batches and place them inside any of the six storage cups included in the package. If you are on the go, you can also use the sippy cup by simply replacing the blades with a cup lid which also comes with a wide straw perfect for thick smoothies. If you are looking for the best food processor for baby food without a lot of fuss, this Nuk food maker should be high up in your list. It grows with your child so you do not have to throw away old appliances and trade it for yet another new one for every phase of your child’s growth. Plus, the 20-piece package already comes with every single thing you need to make fresh homemade meals for your baby. Say goodbye to using canned baby food whose ingredients you are unsure of. Despite this product being very popular among parents, there are still a few who are disappointed with its performance saying that it is not as strong and durable as it is expected to be. You will have to remember though that this item is made from plastic and not glass so you have to take extra caution to make sure you do not overwork it. Regardless, we still think that this product deserves to be placed at the fourth spot. When it comes to all-in-one baby food makers, there is only one name that comes to mind: Baby Brezza. It can be used for multiple functions so parents no longer have to purchase additional appliances; no wonder it makes it to our list! What do we love most about this baby food maker? Well, for starters, parents can use it as a steamer. Simply put in all the fresh ingredients inside and set the steam time. The machine will do all the hard work for you and all you have to do is wait. Even better is that you do not have to take out the steamed ingredients out of the container because you can have them blended in the same bowl; parents can certainly say goodbye to the hassle of transferring hot food in the middle of the process. You can even have baby on one arm and prepare food with the other without any problem. Of course, if you want to defrost meat or other ingredients or reheat food that you have previously prepared, you can also do that using this mean baby machine. Although the plastic material of the container makes a lot of parents hesitant about getting this product especially since heat and steaming is involved, there have been also numerous positive reviews about it. So, parents need not worry because the plastic holds up really well. However, if you are still hesitant, Baby Brezza has also released a glass version of their famous baby food processor. While we like that this machine comes with every functionality that parents are looking for in a food processor (you can now ditch the steamer and hand mixer), there are complaints about the coating in the water reservoir peeling off during steaming so we will have to place this one down the bottom of our list. Still, we think that this item is worth the consideration when looking for a food processor for baby food! You will never think that preparing food for a baby can be such a hassle until you have one. Parents all want the best for their babies and, when it comes to solid food, we definitely want to make sure that they get the freshest and healthiest meals every single time. Depending on your lifestyle, you might want to compare a food processor vs blender but whichever you choose, make sure that it actually helps you create delicious meals with less hassle. Which parent would you rather be: the one that uses these nifty food processors or one who uses hand grinders for food? Don’t forget to keep the screaming, hungry, crying baby in mind! Why do i need a Baby Food Maker? It just makes life soo easy. It is one machine which does many jobs without having to cramp your kitchen platform with 4 different equipments. This is an all in one wonder machine for moms. Why can't i use a normal food processor instead? Food processors only does the job of chopping and blending of fruits and vegetables. But the food maker chops, cooks, blends and helps us store the food as well. Some food makers have milling attachment which help to grind down rice and oats which is then cooked for the babies. Can i cook more than one serving and store it? Yes you can. The food maker comes in various sizes. Please read the details of the product before buying. You could cook large portions and store them in small containers/beakers provided along with the product and freeze it. Do i need to be in front of it to cook in the baby food maker? Not necessary. You could put all the ingredients in and select the function you want to perform. Once the job is done it beeps and auto switches itself off. Some models also has a one touch functionality for you to operate, even with your little one in your other hand. What do i do with the food maker when my child has grown bigger? The food maker grows with your child. You could still use it to make yummy smoothies, juices, popsicles etc. The containers can be used for storing and carrying food for your toddler when you are travelling. Is it worth buying a Baby Food Maker? Absolutely. There is a whole range of products available with different functionalities to suit your budget. Don't forget to read through our reviews page on Baby Food Makers before you decide on which one to buy. Where can i find the Baby Food Maker recipes? Most products provide a baby food recipe booklet along with the product. 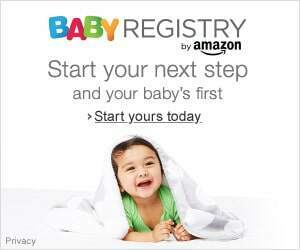 You could also find loads of them online or try your very own to amuse your baby. Where can i buy cheapest Baby Food Maker? If it is for your little one, you wouldn't want to compromise on the quality of the product, especially which makes food for them. There are many branded ones which are available at mid range prices. Please read through our review page for more details. Where can i buy food makers? You could buy it in store or online through trusted retailers like Amazon.